This is the best you can do with a redundant swimming pool. Let us transform it into your own paradise. 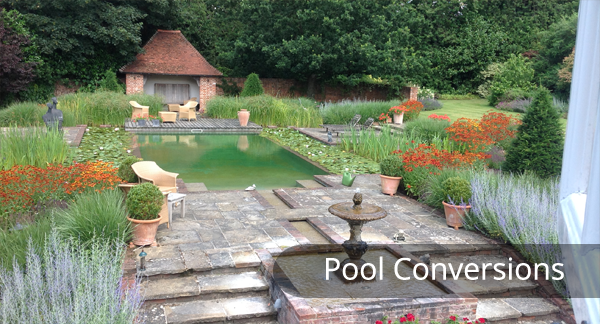 Natural swimming pools look better all year and are far more suitable for swimming and relaxing by in the UK. We can convert into a natural pool (min. 50 % of surface is plants ) or a Pure Living pool (with or without plants). If the swimming pool and equipment is in reasonable condition, simple conversion can be done. The existing chemical treatment equipment is replaced with a biological foam and phosphate absorbing filters. The existing sand filter can be kept or replaced with fine mesh skimmers. Plant filtration can be added within the old pool so the swimming width is smaller, or outside to make a bigger feature. Plants can be put in a separate area and at different levels. We recommend relining to provide water tightness for many more years and a more easily cleaned surface. We use black, grey, or green liners for more natural looking water. Turn your neglected pond into something beautiful and useful. In 2014 we pioneered a new filter technique for ponds (without lining). This involves the use of special mineral filters that create exceptionally clear conditions and amazing deep plant growth – in other words, perfect conditions for swimming. 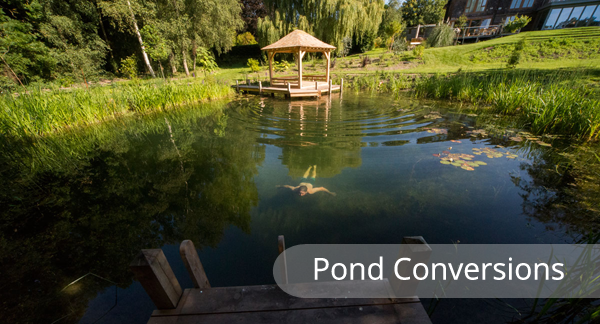 Our first pond conversion in Henfield converted a green duckweed-covered stagnant pond into a tropical paradise….in England. Our second in Eaton Bray was greatly appreciated by the owners. Woodhouse Natural Pool is the first and only company at present to be converting and filtering existing natural water bodies.